Comparison of normal and advanced Steam Centurion. 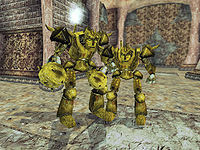 Description: This Dwemer construct is another version of the steam centurion. It was first discovered in a Dwemer ruin below Mournhold. It has been improved in size, attack power and defensive systems compared to the previously known version, and should be treated with extreme caution. The most notably dangerous aspect it has is its reflect ability. Resistant against: all kinds of influences. 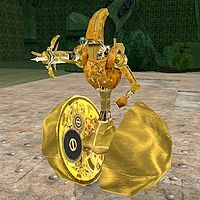 Description: This ancient Dwemer construct is another version of the centurion sphere, able to fire highly potent darts. 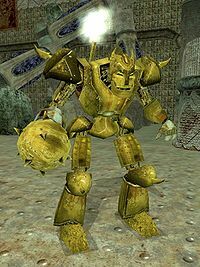 It was first discovered in a Dwemer ruin below Mournhold. Drops: Dwarven Darts, Scrap Metal. Resistant against: paralysis and shock. This page was last modified on 21 March 2015, at 22:40.